The next upcoming Palm Sunday is on Sunday April 14th, 2019. 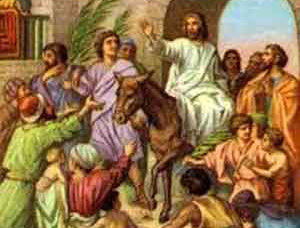 The day celebrates Jesus's return to Jerusalem on Palm Sunday with a feast and include people carrying palms representing the palm branches spread out in front of Jesus as he rode a donkey into Jerusalem. Churches will provide services with parishioners standing in a procession each holding a palm branch or other branches depending on the native tree species available to celebrate Jesus' entry back to Jerusalem thus beginning Holy week. The day celebrates Jesus return to Jerusalem and the reference to palms is what people symbolically (small branches of trees) along with their clocks laid out for him to go over as he came into the city. It was customary in the day to cover the path for someone thought of high honor and importance.